Art For The AIZ is an expanding collection of John Heartfield’s brilliant political art for the AIZ (Arbeiter-Illustrierte-Zeitung – The Workers Pictorial Newspaper). AIZ circulation reached between 300,000-500,000 copies. 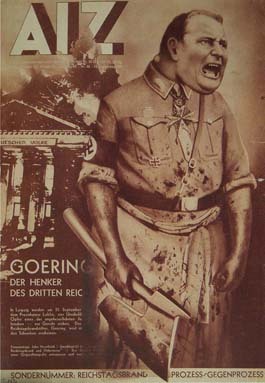 Heartfield anti-fascist collages and anti-Nazi art appeared on corner newsstands all over Berlin. Hitler made it crystal clear he wanted to murder the art. Heartfield barely escaped a Nazi assassination squad in April 1933, one month after Hitler took complete control of Germany. But the political artist rebel refused to stop. He continued to produce art for the AIZ from Prague, Czechoslovakia until 1938. Brochures is a growing collection of the stunning art and collages Heartfield created for World War II anti-fascist brochures distributed throughout Europe. Der Knüppel was a satirical anti-fascist periodical that appeared on a non-scheduled basis from 1923-1927. Die rote Fahne was the central publication of the KPD (German Communist Party). The KPD was the only real German political opposition party to Hitler’s Nazi Party. Nazi propaganda blamed the burning of the Reichstag on the KPD (among others). 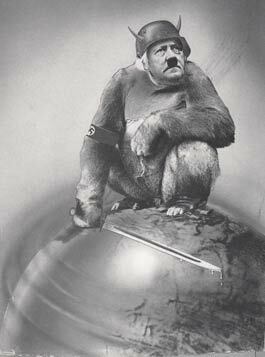 READ: John Heartfield. Famous Art. Unwavering Courage. Fascism, Hitler and The Third Reich. Not Simply A Portrait Of Adolf Hitler. All Who Would Be Dictators. Five Fingers Has The Hand. John Heartfield believed his anti-fascist and antiwar collages should be easily available to as many people as possible. They were warnings. The message that runs through his work is that authoritarian ideas can never be a solution. John Heartfield achieved his goal of mass distribution of his political art through the painstaking process of rotogravure. Heartfield’s grandson, John J Heartfield, is certain his grandfather would have loved to distribute his work through the Internet. These masterpieces of political art appeared on the covers of magazines and periodicals with the highest circulations inside Nazi Germany and Europe. The exhibition plans to display all 240 Heartfield AIZ Magazine covers that he produced at an astonishing rate between 1930 and 1938. Of course, Heartfield’s mastery of mixed media and typography is quickly apparent. His stunning images were visual jolts to the senses. His “Photomontages Of The Nazi Period” are masterpieces of graphic design. While remaining a resident of Berlin, Heartfield produced political photo montage images that shouted from street corners that the promises of Adolf Hitler and The Nazi Party were built on hypocrisy, bigotry, race hatred, and extreme nationalism. When Hitler seized power in 1933, all political opposition was outlawed. Heartfield narrowly escaped an SS assassination attempt in Berlin on April 14, 1933. 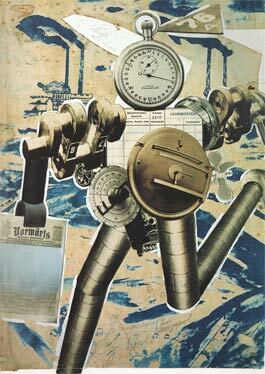 He fled to Czechoslovakia where he continued to produce his collages “as a weapon” against fascism and The Nazi Party. As the Nazi war machine moved towards Czechoslovakia, John Heartfield’s works of political art made him number-five on the Gestapo’s most wanted list. Like so many artists and writers in the early part of the twentieth century, an idealistic young John Heartfield believed the ideals of communism would bring about a fair and peaceful world. He joined the German Communist Party (KPD) in 1919. The KPD was the only serious political threat to the rise of Adolf Hitler and The Nazi Party. Germany was suffering because of conditions created by World War One’s Treaty Of Versailles. Both the KPD and The Nazis promised a better life for ordinary Germans. However, communism proved to be a brutal and unjust system of government. 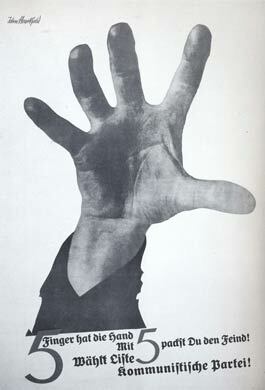 Heartfield discovered that when he suffered persecution by The East German Communist Party (GDR Communism). He pleaded to remain in England after the war for “his work and his health.” He was nearly tried for treason when he had to return to East Germany because of the length of his stay in England and the fact his dentist was under suspicion by the Stasi, the East German Secret Police. The Exhibition is always growing.